Wild hares and garden-ruining groundhogs won't stand a chance when you employ these excellent .22 Magnum cartridges from Winchester! Each of these high-velocity rounds propels at 30-grain V-Max projectile which was designed by Hornady to exhibit head-turning accuracy and devastating terminal ballistics. This particular V-Max bullet uses a copper jacketed lead core with a flat base and a tapered hollow cavity. The frontal cavity is capped off with a polymer tip that matches the shape of the projectile's ogive for superior drag resistance. When the lightweight bullet strikes a target, the plastic tip is driven backward into the round in order to initiate rapid fragmentation; this effect delivers deadly energy to a small game animal's vital organs while decreasing the chance for over-penetration. As a result, a hunter can expect quicker, more humane drops with less damage done to pelts and edible meat. 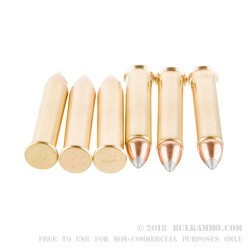 The bullet is contained within a freshly rolled brass casing that is driven by clean-burning propellant and ignited by a non-corrosive primer formula. Winchester's reputation was quality and American ingenuity is cemented by over 150 years of firearms design and caliber development. Their products are based on meticulous research, strong traditions, and real world feedback in order to serve shooters of all kinds with proven performance.